The immune cells and tumors that originate in lymph nodes are exposed to lymphatic fluid forces. 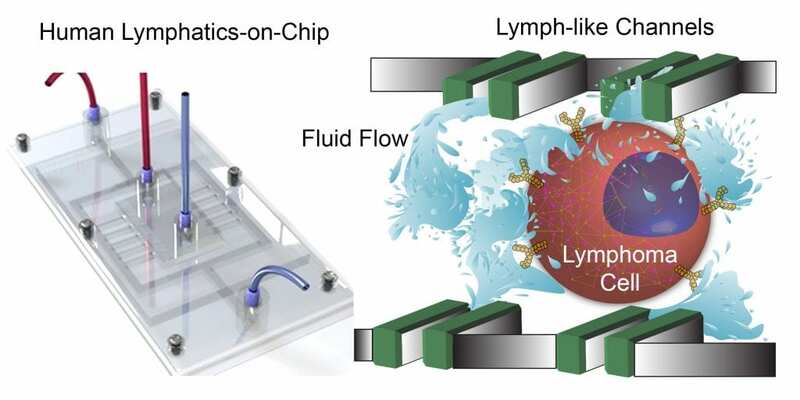 In a recent study published in Cell Reports, we have developed a lymphatic-on-chip like device that recapitulates flow inside lymph vessels and parts of the lymph node. We used this technology to describe the role of fluid forces, from lymphatics and neo-vessels, in mechanomodulation of integrin and B cell receptor signaling. These insights shed light on the heterogeneous nature of lymphomas and may allow faster translation of therapeutics. This is the team’s first step toward modeling lymphatic systems and the effects of fluid flow on them, which we plan to further modify with relevant lymphatic cells and use for understanding immunity and malignancy.